The NYC Sightseeing FlexPass: Admission to Top Attractions, Bus Tours, Cruise, Dining and More! Pay only for the number of attractions you wish to see and save up to 50% on your New York tour! Choose between walking and biking tours, cruises and more! Visit popular attractions, museums and enjoy great offers in restaurants! Once you have exchanged the vouchers for The Sightseeing Pass, your pass is ready for use. Customize your own itinerary with the Sightseeing Flexi Pass and save up to 50% on your New York City tour! Choose 2, 3, 5, 7 or 10 popular activities and have up to 1 month to use your pass from the day of card activation. Pay only for the number of attractions you wish to see and choose from over 90 options including top NYC attractions, museums and tours. Simply show your pass at the attraction you are visiting and get free admission. This is the only ‘choice’ pass on the market that includes One World Observatory, a must-do when in New York! Some of the many top NYC attractions covered by the Sightseeing FlexPass are 9/11 Tribute Center, Madame Tussauds New York Wax Museum, One World Observatory and Ripley’s Believe It or Not! New York among other attractions. 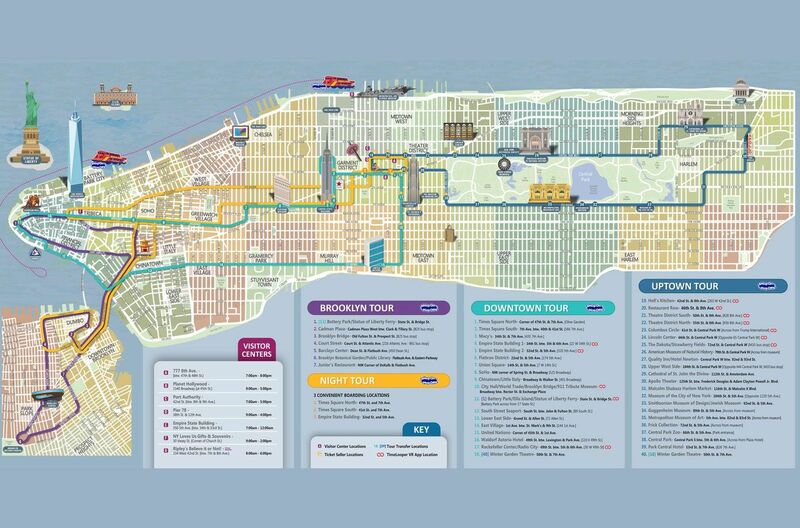 Choose from a prolific range of bus tours including Gray Line City Sightseeing Uptown and Downtown tours, night tour, on locations tours and many more fun sightseeing options. Also included in the pass is a number of exclusive dining offers in a number of restaurants like the "BB" Kings Blues Club & Grill, Buca di Beppo Restaurant, Buffalo Wild Wings Restaurant and more. There are also a plethora of walking and biking tours as well as cruises that you can go for to enjoy your New York City visit to the hilt! To use your pass, simply show it at the main ticket office for each attraction you select for admittance, unless otherwise noted below. Your pass is valid for the amount of attractions you selected when purchasing your pass (2, 3, 5, 7 or 10). Passes that have not been activated expire one year from the purchase date. Once activated, your FlexPass is valid for 30 days. Top of the Rock Observation Deck and the Wildlife Conservation Society which brings with it the Bronx Zoo, the Central Park Zoo and the New York Aquarium are new additions which will be available to all Pass holders starting from 1 April 18. Also starting on April 1st, New York Sightseeing Pass holders will receive a 3-day ticket to all Met locations, including The Met, Met Breuer, and The Cloisters. This enhancement to the Sightseeing Pass program will allow you to experience all of the Met locations at their leisure, without restrictions, for as many as three consecutive days. Lastly, also effective April 1, Empire State Building is not included as part of the Sightseeing Pass program. The two preferred observations decks, Top of the Rock and One World Observatory are excited to welcome Pass holders with an elevated level of service and breathtaking views that you will remember for a lifetime. You may get a credit of $40 USD when you purchase the pass, you will receive the QR code with a number and with this number you can use the credit. Each Pass holder will be able to use it with options including attractions, tours, helicopter rides, broadway shows, day trips & dinner cruises.